Welcome to Recreation Express Transportation Company, Inc. We are a locally owned school bus company based in the Tampa Bay area. If you choose to use our service, you can be assured that your group will receive first class treatment. Safety and punctuality for your trip are the foundation on which Recreation Express was founded on. We strive to maintain an outstanding relationship with our customers and provide some of the best rates in town. Recreation Express provides bus service to all of the bay area, St.Petersburg, Sarasota and Orlando. Our buses run anytime; day or night. Give us a call today to book your next trip! Recreation express works with many area attractions, and we strive to get your group the best group rate possible. We also provide bus service to any private school looking to reach out to specific areas of town. We understand that it is sometimes difficult for parents to get their children to and from school. We would be happy to provide this service for you. Recreation Express is now offering party/shuttle buses. If your group is looking for something with a little more comfort and style, we have now added these buses to our fleet. Let us take your group around in our 30 passenger, clean party/shuttle buses. All of these types of buses are equipped with CD players and all have ice cold A/C. 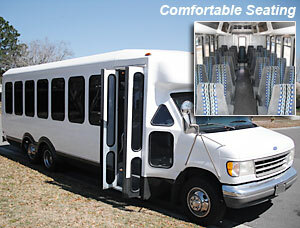 This bus is perfect for senior groups, church groups or any type of charter. We also service event planning and destination management companies. For any travel agencies looking to provide this style of bus, we would be happy to offer you great rates. This bus is also great for proms, homecoming, bachelor and bachelorette parties. Typically these types of buses are very expensive to charter. However, remember the Recreation Express motto, absolute best service for the absolute best prices. The rates for this style of bus are great! Please give us a call for details. Copyright © 2009-2017 Recreation Express, Tampa FL. All Rights Reserved. Designed by Internet Marketing - Website Design, Naples FL.